Huawei P30 Pro to Come in Sunrise Red Variant - Playfuldroid! Recent reports have revealed that the Huawei P30 and P30 Pro smartphones that are scheduled to go official on March 26 will be coming in colors like Black, Aurora and Ice White. 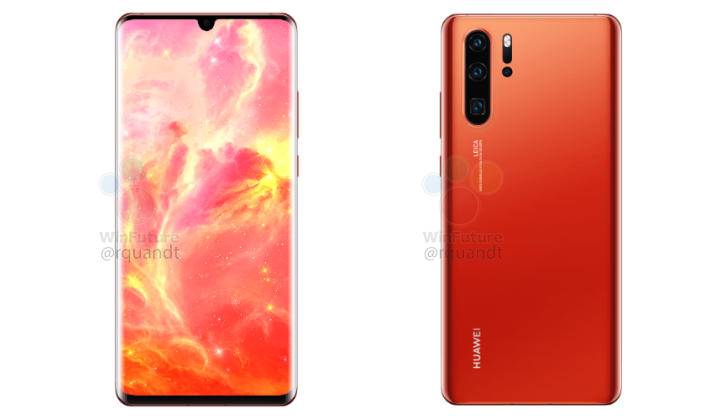 According to fresh information on WinFuture.de, the Huawei P30 Pro will be available in an additional color of Sunrise Red. The Sunrise Red edition of the Huawei P30 Pro appears orangish-red in the upper area of the back panel. The color shifts to light red and then to its darker hue towards the bottom area of the back panel. Through another report on the same publication it has been revealed that the Huawei P30 Pro will be lacking a 3.5mm audio jack. Hence, its users will have to either make use of USB-C enabled headphones or wireless Bluetooth earbuds to listen to the music. Also, it will come equipped with an IR blaster. The Huawei P30 will retain the 3.5mm headphone jack, but it won’t be featuring an IR blaster. The Huawei P30 and P30 Pro are scheduled to go official on March 26 through a launch event that will be held in Paris, France. As of this writing, there is no information available on the pricing of the Kirin 980 powered upcoming flagship phones from the Chinese firm.